Origin of name From the Mongolian öbür monggol, where öbür means the front, sunny side of natural barrier (a mountain, mountain range, lake or desert etc..). Inner Mongolia (Mongolian: , or Öbür mongγul; Chinese: 内蒙古; pinyin: Nèi Měnggǔ; also romanized as Nei Mongol) is a Mongol autonomous region of the People's Republic of China that stretches across the northern part of the country. The region has a long southern border, and from east to west it shares that border with Heilongjiang, Jilin, Liaoning, Hebei, Shanxi, Shaanxi, Ningxia Hui Autonomous Region, and Gansu. To the north it borders Mongolia and Russia. Inner Mongolia has a total land area of 1.18 million km², which occupies about 12 percent of China's total land area. It had a population of about 24 million as of 2004. 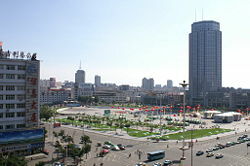 The capital city of the region is Hohhot. The official languages of Inner Mongolia are Standard Mandarin and Mongolian, with the latter written in the Mongolian classical alphabet. In Chinese, the region is known as "Inner Mongolia," where the terms of "Inner/Outer" are derived from the Manchu words dorgi/tulergi. Inner Mongolia is distinct from Outer Mongolia, which was a term used by the Republic of China and previous governments to refer to what is now the independent state of Mongolia plus the Republic of Tuva in Russia. In Mongolian, the region is known as öbör mongγol where öbör can mean south, inner, front, bosom, or breast. This is probably related to traditional Mongolian and Manchu world views, where the directions are reversed, and the south is regarded as the front, the right as west, the left as east, and the north as rear. Some Mongolians also use the name "Southern Mongolia" in English to refer to the region. Inner Mongolia has played a role in world history far beyond that of most countries, let alone provinces of a country or empire. A massive territory, comprising one eighth of the People's Republic of China, embracing the expansive Gobi Desert and seemingly endless plains, the tribal peoples of the thirteenth and fourteenth centuries swept out of Mongol to conquer much of the civilized world at that time. Skilled as horsemen on the plains, using the stirrup to steady their aim with the bow and arrow while running at full speed, the Mongol cavalry swept away all enemies in front of them. Their skills on the battlefield failed to match their values and civilization, with succeeding empires removing almost all traces of their rule. The autonomous province of Inner Mongolia, bordering Russia and many provinces in China, has a key role to play in China's development during the twenty-first century. Throughout most of history, central and western Inner Mongolia, especially the Hetao region, alternated in control between Han Chinese agriculturalists in the south and Xiongnu, Xianbei, Khitan, Nurchen, and Mongol nomads in the north. Eastern Inner Mongolia was historically part of Manchuria, so its historical narrative consists mostly of constant struggle between different groups within Manchuria rather than the struggle between nomads and Chinese agriculturalists that the rest of the region experienced. During the Zhou Dynasty, central and western Inner Mongolia (the Hetao region and surrounding areas) were inhabited by nomadic peoples such as the Loufan, Linhu, and Dí, while eastern Inner Mongolia was inhabited by the Donghu. During the Warring States Period, King Wuling (340 B.C.E.–295 B.C.E.) of the state of Zhao based in what is now Hebei and Shanxi provinces pursued an expansionist policy towards the region. After destroying the Dí state of Zhongshan in what is now Hebei, he defeated the Linhu and Loufan and created the commandery of Yunzhong near modern Hohhot. King Wuling of Zhao also built a long wall stretching through the Hetao region. After Qin Shihuang created the first unified Chinese empire in 221 B.C.E., he sent the general Meng Tian to drive the Xiongnu from the region, and incorporated the old Zhao wall into the Qin Dynasty Great Wall of China. He also maintained two commanderies in the region: Jiuyuan and Yunzhong, and moved 30,000 households there to solidify the region. After the Qin Dynasty collapsed in 206 B.C.E., these efforts were abandoned. During the Western Han Dynasty, Emperor Wu sent the general Wei Qing to reconquer the Hetao region from the Xiongnu in 127 B.C.E.. After the conquest, Emperor Wu continued the policy of building settlements in Hetao to defend against the Xiongnu. In that same year, he established the commanderies of Shuofang and Wuyuan in Hetao. At the same time, what is now eastern Inner Mongolia was controlled by the Xianbei, who would later on eclipse the Xiongnu in both power and influence. During the Eastern Han Dynasty (25–220), the Xiongnu who surrendered to the Han Dynasty began to settle in Hetao, intermingling with the Han immigrants in the area. Later on during the Western Jin Dynasty, it was a Xiongnu noble from Hetao, Liu Yuan, who established the Han Zhao kingdom in the region, thereby beginning the Sixteen Kingdoms period that saw the disintegration of northern China under a variety of Han and non-Han (including Xiongnu and Xianbei) regimes. The Sui Dynasty (581–618) and Tang Dynasty (618–907) eventually re-established a unified Chinese empire, and like their predecessors they conquered and settled people into Hetao. However, these efforts were aborted when the Tang Empire began to collapse. Hetao (along with the rest of what is now Inner Mongolia) was then taken over by the Khitan Empire (Liao Dynasty), founded by the Khitans, a nomadic people originating in what is now the southern part of Manchuria and eastern Inner Mongolia. They were followed by the Western Xia of the Tanguts, which took control of what is now the western part of Inner Mongolia (including western Hetao). The Khitans were later replaced by the Jurchens, precursors to the modern Manchus, who established the Jinn Dynasty over Manchuria and northern China. Genghis Khan unified the Mongol tribes in 1206, moved into Inner Mongolia, and conquered the Tanguts in 1227 and the Jurchens in 1234. His descendants completed his conquest of China in 1279, establishing the Mongol Yuan Dynasty. After the Yuan Dynasty was evicted from China by the Han Chinese Ming Dynasty in 1368, the Ming rebuilt the Great Wall of China along its present location, which roughly follows the southern border of the modern Inner Mongolia Autonomous Region (though it deviates significantly at the Hebei-Inner Mongolia border). "Outer Mongolia": The four leagues (aimag) of the Khalkha Mongols in northern and central Mongolia, as well as the Tannu Uriankhai and Khovd regions in northwestern Mongolia, were overseen by the General of Uliastai at the city of Uliastai. This is equivalent to the modern independent state of Mongolia, the Russian-administered region of Tannu Uriankhai, and part of northern Xinjiang. "Inner Mongolia": The banners and tribes of southern Mongolia came under six leagues (chuulghan): Jirim, Juu Uda, Josutu, Xilingol, Ulanqab, and Yeke Juu. This is equivalent to most of modern Inner Mongolia and some neighboring areas in Liaoning and Jilin provinces. "Taoxi Mongolia": The Alashan Oolud and Ejine Torghuud banners were separate from the aimags of Outer Mongolia and the chuulghans of Inner Mongolia. This is equivalent to the westernmost part of modern Inner Mongolia. The Chahar Eight Banners were controlled by the military commander of Chahar (now Zhangjiakou). Their extent corresponds to southern Ulanqab and Bayan Nur in modern Inner Mongolia, plus the region around Zhangjiakou in Hebei province. At the same time, the jurisdiction of some border departments of Zhili and Shanxi provinces also overlapped into this region. The Guihua Tümed banner was controlled by the military commander of Suiyuan (now Hohhot). This corresponds to the vicinities of the modern city of Hohhot. At the same time, the jurisdiction of some border departments of Shanxi province also overlapped into this region. The Hulunbuir region, in what is now northeastern Inner Mongolia, was part of the jurisdiction of the General of Heilongjiang, one of the three generals of Manchuria. Ordinary Mongol citizens were not allowed to travel outside their own leagues. While there had been Han Chinese farmers in what is now Inner Mongolia since the time of Altan Khan, mass settlement began in the late nineteenth century. The Manchus were becoming increasingly sinicized, and faced with the Russian threat, they began to encourage Han Chinese farmers to settle in both Mongolia and Manchuria. This policy has been followed by subsequent governments, leading to the shift in demographics today, where the Han Chinese presence in Inner Mongolia represents the largest ethnic group in the region. The railroads that were built in these regions were especially useful to the Han Chinese settlers. Land in the area was either sold by Mongol princes, leased to Han Chinese farmers, or simply taken away from the nomads and given to Han Chinese farmers. Rehe province was created to include the Juu Uda and Josutu leagues, plus the Chengde area in what is now northern Hebei. Taoxi Mongolia, i.e., Alashan and Ejine leagues, was incorporated into neighboring Gansu province. Later on Ningxia province was split out of northern Gansu, and Taoxi Mongolia became part of Ningxia. The entire region of Manchuria came under the control of the Japanese puppet state of Manchukuo in 1931, following the Japanese invasion of China. This brought the Mongol areas in the Manchurian provinces (i.e., Hulunbuir and Jirim leagues) under the control of the Japanese. Rehe was also incorporated into Manchukuo in 1933, taking Juu Uda and Josutu leagues along with it. These areas were administered by Manchukuo until the end of World War II in 1945. In 1937, open war broke out between the Republic of China and Japan. On December 8, 1937, Mongolian Prince De Wang declared the independence of the remaining parts of Inner Mongolia (i.e., the Suiyuan and Chahar provinces) as Mengkiang or Mengkukuo, and signed agreements with Manchukuo and Japan, thereby turning Inner Mongolia into a puppet region of the Japanese empire. The capital was established at Zhangbei (now in Hebei province), with the puppet government's control extending as far west as the Hohhot region. In August 1945, Mengkiang was taken by Soviet and Outer Mongolian troops during Operation August Storm. Following the end of World War II, the Chinese Communists regained Manchuria with some Soviet support, and established the Inner Mongolia Autonomous Region in 1947 following the Soviet nationalities model of administration. Initially, the autonomous region included just the Hulunbuir region, but over the next decade, as the communists established the People's Republic of China and consolidated control over mainland China, Inner Mongolia was expanded westwards to include five of the six original leagues (except Josutu League, which remains in Liaoning province), the northern part of the Chahar region, by then a league as well (southern Chahar remains in Hebei province), the Hetao region, and the Alashan and Ejine banners. Eventually, nearly all areas with a sizable Mongol populations were incorporated into the region, giving present-day Inner Mongolia its elongated shape and large land area. In 1969, during China's Cultural Revolution, much of Inner Mongolia was distributed among surrounding provinces, with Hulunbuir divided between Heilongjiang and Jilin, Jirim going to Jilin, Juu Uda to Liaoning, and the Alashan and Ejine region divided among Gansu and Ningxia. This was reversed in 1979, when Deng Xiaoping led China. As of today, there are several groups calling for the independence of Inner Mongolia from what they view as Chinese imperialism. These groups however, have much less influence and support within and outside Inner Mongolia than similar movements in Tibet, Xinjiang, and Taiwan. Inner Mongolia's land area is the third largest in all of China. Its grasslands account for one fourth of China's total grassland area, and its forest area is the second largest in China. The region is quite varied geographically, with a number of hills, plains, deserts, rivers and lakes. It also has several plateaus which range around 1,000 meters in height. 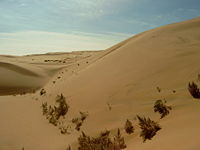 These plateaus include the Inner Mongolia Plateau, which is the second largest among the four major plateaus in China. 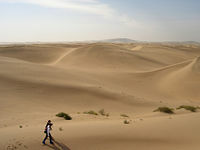 The Gobi Desert, which is the largest desert in Asia and the fourth largest desert in the world, stretches across the province and crosses over the border with Mongolia. The region has a temperate continental climate. Its spring season is warm and windy, its summer is short and hot with many rainy days, its autumn usually sees early frost and plummeting temperature, and it has long, extremely cold winters, with frequent snowfall and blizzards. The region has an annual precipitation of 100-500 mm, 80-150 frost-free days, and 2,700 hours of sunshine. The Greater Hinggan Mountains and the Yinshan Mountains divide the region into areas with different climate. The area east of the Greater Hinggan Mountains and north of the Yinshan Mountains has lower temperature and less precipitation than the other areas in the region. Inner Mongolia is divided into 12 prefecture-level divisions, including nine prefecture-level cities and three leagues. The 12 prefecture-level divisions of Inner Mongolia are subdivided into 101 county-level divisions, including 21 districts, 11 county-level cities, 17 counties, 49 banners, and three autonomous banners. Those are in turn divided into 1,425 township-level divisions, including 532 towns, 407 townships, 277 sumu, 18 ethnic townships, one ethnic sumu, and 190 subdistricts. The farming of crops such as wheat is an integral part of the local economy along the various river valleys in the region. Besides wheat, other basic crops include oat, millet, sorghum, maize, potatoes and rice, while cash crops include soy beans, linseed, rapeseed, castor-oil plants and sugar-beets. In the more arid grasslands, the herding of goats, sheep and other animals is a traditional method of subsistence. Inner Mongolia as a whole ranks among the top five in terms of major pastoral areas in the country. Hunting is also important in the Greater Khingan ranges to the east, while reindeer herding is carried out by Evenks in the Evenk Autonomous Banner. Along with its agriculture, Inner Mongolia provides about one sixth of China's total lumber through its forests in the Greater Hinggan Mountains. Inner Mongolia has an abundance of resources, including iron, chromium, copper, lead, zinc, gold, mica salt , cashmere, natural gas, rare earth elements, and more deposits of naturally-occurring niobium, zirconium and beryllium than any other province in China. In the past, the exploitation and utilization of these resources was managed inefficiently, which resulted in a poor return on the various rich resources. However, with increased economic growth in the country, this has changed in recent years. As a result, Inner Mongolia has emerged as an important coal production base for north China. It plans to double annual coal output by 2010 (from the 2005 volume of 260 million tons) to a total of 500 million tons of coal a year. . As it stands now, its current coal reserves are the second highest in the country, behind only Shanxi. Industry in Inner Mongolia has developed mainly around coal, power generation, and forestry-related industries. The region has recently shifted emphasis to focus on six competitive industries, including energy, chemicals, metallurgy, equipment manufacturing, processing of farm (including dairy) produce, and hi-tech products. The nominal GDP of Inner Mongolia in 2006 was 479 billion yuan (US$60.1 billion), a growth of 18 percent from 2005, with an average annual increase of 16.6 percent. Its per capita GDP exceeded 20,000 yuan (US$2,500). In 2005, Inner Mongolia's primary, secondary, and tertiary industries were worth 60.01 billion yuan, 168.51 billion yuan, and 153.76 billion yuan respectively. In 2006, The urban per capita disposable income and rural per capita net income were 10,358 yuan and 3,342 yuan, up 12 percent and 11.8 percent respectively. As with much of China, tremendous economic growth has led to a boom in construction, including new commercial development and large apartment complexes. In addition, the central government's policy to "revitalize the northeast" has seen some improvements to Inner Mongolia's economy, and should improve it even further in the future. Han Chinese are the largest ethnic group in Inner Mongolia, constituting about 80 percent of the population. They live mostly in the Hetao region as well as various other centers in central and eastern Inner Mongolia. As would be expected in an autonomous region designated for them, Mongols are the second largest ethnic group, comprising about 17 percent of the population. They include many diverse Mongolian-speaking groups, such as the Buryats and the Oirats, both of whom are officially considered to be Mongols in China. Many of the traditionally nomadic Mongols have settled in permanent homes in the region, as their pastoral economy was collectivized during the Maoist Era of Chinese history. Besides these two groups, there are also several other ethnic groups in Inner Mongolia, including the Daur, the Evenks, the Oroqin, the Hui, the Manchus, and Koreans. Education levels continue to grow steadily in Inner Mongolia, as it does in many other parts of North China. According to statistics from the end of 2000, the region had established 18 institutions of higher education, with 77,967 students and 8,856 teachers. It also had 2,218 secondary schools with 1,621,258 students and 101,036 teachers and 10,147 primary schools with 2,015,076 students and 129,242 teachers. A general trend in education in Inner Mongolia has been the increase in the size of the educated population, with the average number of years of schooling among the population increasing annually. In addition, the attendance rate of school-age children in the region was 99.46 percent, which is fairly even with the rest of the country. All of the above are under the authority of the autonomous region government. Institutions without full-time bachelor degree programs are not listed. The Han Chinese of Inner Mongolia speak a variety of dialects, depending on their region. 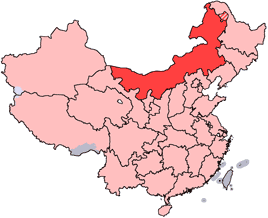 The eastern parts tend to speak Northeastern Mandarin, which belongs to the Mandarin group of dialects, while those in the central parts, such as the Huang He valley, speak varieties of Jin, another subdivision of Chinese, due to its proximity to other Jin-speaking areas in China such as the Shanxi province. 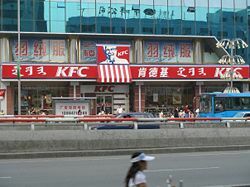 Cities such as Hohhot and Baotou both have their unique brand of Jin Chinese which are sometimes incomprehensible with dialects spoken in northeastern regions such as Hailar. Mongols in Inner Mongolia speak a variety of dialects of the Mongolian language, including Chahar, Bairin, Ordos, Ejin-Alxa, Barghu-Buryat, and others. The standard pronunciation of Mongolian in China is based on the Chahar dialect of the Plain Blue Banner, located in central Inner Mongolia. This is different from independent Mongolia, where the standard pronunciation is based on the Khalkha dialect. The Daur, Evenks, and Oroqin also speak their own respective languages. By law, all street signs, commercial outlets, and government documents in Inner Mongolia must be bilingual, displaying both Mongolian and Chinese. Many ethnic Mongols, especially those from the newest generation, speak fluent Chinese, as Mongolian is beginning to recede in everyday use in urban areas. Ethnic Mongols in rural areas, however, have kept their traditions. In terms of written language, Inner Mongolia has retained the classic Mongol written script as opposed to Outer Mongolia's adoption of the Cyrillic alphabet. The vast grasslands have always been symbolic of Inner Mongolia. Mongolian art often depicts the grassland in an uplifting fashion, emphasizing the nomadic traditions of the Mongol people. The Mongols of Inner Mongolia practice many traditional forms of art. Inner Mongolian specialty cuisine, largely derived from the tradition of ethnic Mongols, consists of dairy-related products and hand-held lamb (手扒肉). In recent years franchises based on Hot pot had sprung up from Inner Mongolia, the most famous of which is Xiaofeiyang (小肥羊). Inner Mongolia is also known commercially for the brand names Mengniu and Yili, both of which began with the production of dairy products and ice cream. Among the Han Chinese of Inner Mongolia, Jinju or Shanxi Opera is a popular traditional form of entertainment. See also: Shanxi. Xiaozhao Temple, also known as Chongfu temple, is a Lamaist temple built in 1697 and favored by the Qing Dynasty emperor Kangxi. The grasslands of Inner Mongolia not only provide a spectacular view, but also serve as locations for some of Inner Mongolia's cultural sights, such as horse and camel riding, rodeo competitions, archery, and traditional singing and dancing. ↑ 内蒙古自治区区情 Retrieved July 10, 2012. ↑ Communiqué of the National Bureau of Statistics of People's Republic of China on Major Figures of the 2010 Population Census. National Bureau of Statistics of China. Retrieved July 10, 2012. ↑ People's Daily. Retrieved February 4, 2008. Morgan, David. The Mongols. (The Peoples of Europe.) Oxford, UK: B. Blackwell, 1986. ISBN 9780631135562. Pegg, Carole. Mongolian Music, Dance, & Oral Narrative Performing Diverse Identities. Seattle: University of Washington Press, 2001. ISBN 9780295980300. Sneath, David. Changing Inner Mongolia Pastoral Mongolian Society and the Chinese State. Oxford: Oxford University Press, 2000. ISBN 9780198234135. Williams, Dee Mack. Beyond Great Walls Environment, Identity, and Development on the Chinese Grasslands of Inner Mongolia. Stanford, Calif: Stanford University Press, 2002. ISBN 9780804742788. This page was last modified on 3 March 2018, at 21:39.